Telomeres: being or immortal or getting cancer? “Death takes place because a worn-out tissue cannot forever renew itself and because a capacity for increase by means of cell division is not everlasting but finite” said A.Weismann at Oxford in 1881 and without noticing that he made a brief description of the structure of what we now call as the telomere. The term is originating from Greek: telos means “end” and meros means “part” and currently the definition is more or less about telomeres being parts of a chromosome which are located at the end of them. Telomeres are repetitive tandem sequences that are protecting chromosome stability from degradation, “end fusion, and chromosome aberrant recombination.” (Hou et al. , 2012) They are also “postulated as a universal biological clock that shortens in parallel with aging in cells” (Oeseburg, 2009) Before elaborating on the shortening, lengthening and its outcomes I would like to give a brief historical background of these tiny but extremely important structures. Muller in 1938 first proposed these “end-parts” of chromosomes and then after 23 years Hayflick had the proof that cells were not immortal and had a limited number of times for undergoing cellular division. A Russian researcher called Olovnikov then made the connection between these two correct but thought to be uncorrelated notions. After this point, two scientists observed the sequence in 1978 in the end parts and lastly the identification of the sequence was made in the 80s by Robert Moyazis. The problem known as the ‘end-replication problem’ which “describes the effect that linear chromosomes cannot replicate their terminal ends of the chromosome and consequently shorten at each mitotic cycle” (Oesburg, 2009) is actually the basic reason behind this mechanism telomeres being called as a biological clock. An evolutionary finding which was considered as a breakthrough in terms of telomere biology was found in 1985 by Carol Greider: the reverse transcriptase telomerase. 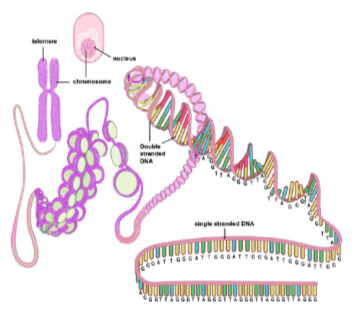 This enzyme “in contrast to DNA-polymerase…is capable of elongating the telomeres” (Oeseburg, 2009) this means that a sequence can be created in the cell if necessary. If the end-replication problem is bypassed with the presence of this mentioned enzyme then theoretically the stability would be reached and furthermore no cell death would be necessary. This mechanism is actually how cancer cells are able to proliferate. Cancer is a disease caused by uncontrolled cell division in a part of the body. When the telomerase activity is more than what chromosome needs for stabilization the process turns into uncontrolled amount of cell divisions. These divisions occur so simultaneously that the replication efficiency drops gradually leading to damages or mismatches to occur. These mismatches results in mutations since their probability of happening are quite high. Mutations in addition to cells that have high telomerase activity therefore cause dysfunctional cells that are uncontrollably dividing. It comes to mind that if we are able to stop telomerase activity we could be able to eliminate the cancer disease from our lives. However, unfortunately inhibiting telomerase activity would again probably end with death. These evolutionary conserved sequences have some vital role in some of our specific cells. The length should be stabilized in certain cells that need to divide as long as we are alive. For example there is this general knowledge that when you break an arm at a young age you recover well and soon however if you break your arm when you are old the recovering percent is low as well as the time it will take will be very long. This is somehow related with telomerase activity. The cells when you are young will have long sequences called to be the telomere. They will have large amount division chances so they will divide and help you recover. The older you get the shorter will be the telomeres and so no new cells will be there to heal you. The only types of cells that will divide until the end of one’s lifespan are stem cells, reproductive cells (until sometime but for a long period of your life) and lastly cancer cells. Even though we hope the cancer cells lose their telomerase’s at some point and diminish the deadly disease the other cells should be able to proliferate for us to be able to repair recombine etc. Research I conducted basically demonstrates the recent founding on telomerase. First I will be comparing the length of telomeres and the effects they have over the cell. The discussion will basically depict the founding on short telomeres and disease it causes as well as long telomeres and the diseases it causes. Then I will elaborate on human telomerase RNA. Lastly I will mention the anti-telomerase cancer treatment and conclude my report. 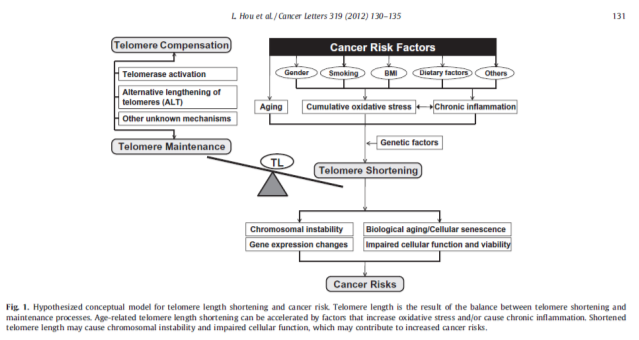 According to Hou’s mini-review Surrogate tissue telomere length and cancer risk: Shorter or Longer? written in 2012 states that “the results have been inconsistent, showing positive, inverse or null associations between TL and cancer risks,” (Hou et al., 2012) however it is also stated that “differences in study design, biological sample collection and processing, specific cancer site, limited statistical power, variability in confounding factors, and differences in laboratory measurement of TL, may be contributing factors to inconsistent results in telomere association studies.” (Hou et al., 2012) Therefore it is very early to conclude on anything, more research has to be done to be sure of the causes and the effects to eliminate this risky factor out of our lives. To begin with, shorter telomere is said to be associated with having a cancer risk more than usual. The studies are made amongst a lot of tissues such as breast, renal cell, bladder, lung etc. “Age-related diseases and premature ageing syndromes are characterized by short telomeres, which can compromise cell viability, whereas tumour cells can prevent telomere loss by aberrantly upregulating telomerase.” (Blasco, 2005) and this finding is supported by another paper published in 2012: “When telomeres become critically shortened, cells undergo either replicative senescence or apoptosis. If such processes are bypassed, cells continue to proliferate through activation of telomerase, leading to genomic instability. The accumulated mutations, genetic lesions, and inactivated tumor suppressor checkpoints may ultimately result in cancer.” (L.Hou et al., 2012) says mini-review conducted in Cancer Letters, and it continues “Our investigation of TL in gastric cancer confirmed that factors increasing oxidative stress or inflammation, such as cigarette smoking, decreased fruit and vegetable intake, and chronic H.Pylori infection are associated with shorter TL in blood DNA.” (L.Hou et al., 2012) Therefore it is viable to say that environmental factors have a great but a partial effect in terms of shortening the telomere length and eventually causing cancer. As for the long telomeres same review mentions the seven recent studies were submitting that cancer patients were exposed to long telomere length. Mostly breast cancer patients were diagnosed with having longer telomere than usual. It is stated that “prolonged estrogen exposure in breast cancer patients could be a possible reason for the longer TL observed in” (L.Hou et al., 2012) some of the studies on breast cancer. Furthermore it is also a fact that these patients have molecular components different than other people “patients with longer TL length had elevated levels of various telomerase-stimulating factors. (L.Hou et al., 2012) With all these data presented it is also plausible to say that longer telomerase may play a role in cancer as well. When a closer look is taken at the molecular levels a study thought “it was surprising that the amount of hTR was high in cell strains that lacked telomerase activity, and the levels did not parallel the increase in telomerase activity, which accompanies immortalization.” (Avilion, 1996) hTR is the acronym for human telomerase RNA and it basically focuses on the interaction between the RNA responsible for making more telomere in the cell. What the researchers found out was this link. According to their findings the fact that hTR not being present in cell lines that did not lack telomerase activity meant that “RNA is not the limiting for telomerase activity, and that the RNA component is not a good predictor of the presence of enzyme activity.” (Avilion, 1996) The result of their experiments showed that telomerase activity was not present much in normal cells but would be detectable during the period in which the cell is in crisis. To demonstrate the statement above they used Northern Blotting and got the analytical data that supported their hypothesis. The conclusion was implying that telomerase activity was regulated in different levels rather than only one since none of the tumor samples they analyzed reflected the telomerase activity. Lastly, the mentioned anti-telomerase cancer therapy has multiple targets but it is challenging due to the several different levels of regulations it has. What is unwanted is the drugs inhibiting the telomerase activity that is mandatory for a person’s daily life. Products, the drugs therefore, should have great specificity, low toxicity and few side effects. It is hoped that the outcomes would be far more positive compared to the initial state of the patient but as far as my research this is a field that is still refreshing itself and developing each and every second. "Telomeres: Effect of Length of the Cell." UKEssays.com. 11 2018. All Answers Ltd. 04 2019 <https://www.ukessays.com/essays/biology/telomeres-effect-length-cell-8712.php?vref=1>. "Telomeres: Effect of Length of the Cell." All Answers Ltd. ukessays.com, November 2018. Web. 26 April 2019. <https://www.ukessays.com/essays/biology/telomeres-effect-length-cell-8712.php?vref=1>. UKEssays. November 2018. Telomeres: Effect of Length of the Cell. [online]. Available from: https://www.ukessays.com/essays/biology/telomeres-effect-length-cell-8712.php?vref=1 [Accessed 26 April 2019]. UKEssays. Telomeres: Effect of Length of the Cell [Internet]. November 2018. [Accessed 26 April 2019]; Available from: https://www.ukessays.com/essays/biology/telomeres-effect-length-cell-8712.php?vref=1.